On May 27, 1950, nearly 1,000 Boy Scouts marched through downtown Cheyenne, Wyo., on their way to the state capitol grounds to dedicate an eight-foot-tall replica of the Statue of Liberty. The Boy Scouts of America celebrated their fortieth anniversary in 1950 with the theme of Strengthen the Arm of Liberty. The campaign was inaugurated in February with a dramatic ceremony held at the base of the Statue of Liberty. 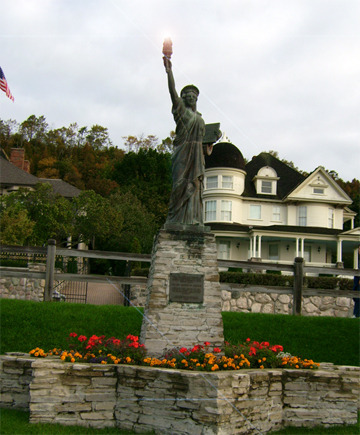 The copper statues were manufactured by Friedley-Voshardt Co. (Chicago, Illinois) and purchased through the Kansas City Boy Scout office by those wanting one. The statues are approximately 8 1/2 feet tall without the base, constructed of sheet copper, weigh 290 pounds, and originally cost $350 plus freight. The mass-produced statues are not great art nor meticulously accurate (a conservator notes that "her face isn't as mature as the real Liberty. It's rounder and more like a little girl's"), but they are cherished. Many have been lost or destroyed, but preservationists have been able to account for about a hundred of them, and BSA Troop 101 of Cheyenne, Wyoming has collected photographs of over 100 of them. Examples of the statues can be found at Fayetteville, Arkansas, Pine Bluff, Arkansas, and at Chimborazo Park in Richmond, Virginia. All across America, towns are shining up a symbol of freedom—200 little sisters of liberty that were dedicated from 1949 to 1951. After decades of neglect, these replicas of the Statue of Liberty are starring again in scores of communities united by pride and love of country. The 8-foot-4-inch copper statues grace parks, main streets, schools, city halls, courthouses, and capitals. Gifts to towns from the Boy Scouts of America to celebrate their 40th anniversary theme “Strengthen the Arm of Liberty,” the statues are standing up for freedom once again.